A great option is Logic Circuit Designer, written by Ivan Andrei. 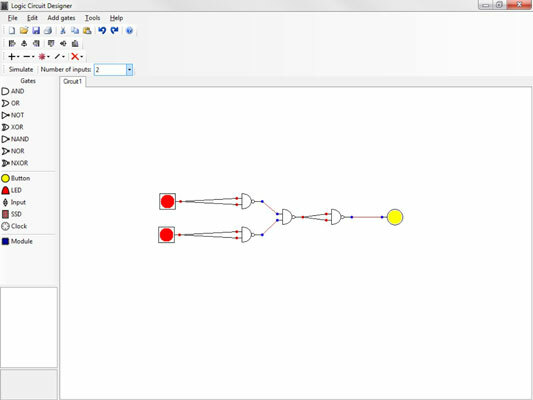 Use the Logic Circuit Designer program to simulate logic circuits on your computer. You can add AND, OR, NOT, XOR, NAND, NOR, and NXOR gates to your circuit simply by dragging them from a toolbar. You can connect the gate inputs and outputs by clicking an input or output and then dragging it to another gate input or output. You can add simple switches to the circuit for external inputs. You can add LEDs at any point in the circuit to indicate the status of an output or an input.